Why are holiday stories such a freaking big hit? I occasionally ask myself that as a writer. I've written whole series dedicated to holidays. These perennial sellers are popular again every single winter. In e- book, print, and now audio! And now that they're all in audio (one of this year's major achievements) they're doing even better. So, what is it about the holidays that I read them as a reader? That I so love writing them as a writer. I think it comes down to hope. Religious or not. Believe in x, y, or z. That isn't relevant. What is relevant is that the holidays represent a better version of ourselves. We've get to imagine that our wishes might come true, our prayers be answered, or that people will just be nicer. Every story I tell, I'm always seeking that hope, that joy. Long ago I set out to create a better future with the stories I tell. One of more hope for those around us. For my family, my friends, and my fans. A sense that anything is possible. Maybe even someday, Peace on Earth and good will toward each other. I like that idea. It's why I write romance. It's why I write holiday tales. Go forth, take this chance to celebrate the season with your favorite holiday reads. Or find a new one. That's certainly going to be my goal this season. I agree that hope is at the heart of the popularity of Holiday Romances, Matt. Hope, and faith - a belief that things will get better in the long run. Thank yo for writing them! Totally agree with you, Matt. There is something about the Holiday Season that brings out the best in many of us. Joining you with Hope for Peace on Earth and good will toward each other comes sooner rather than later. Hope that love exists for everyone is why I read and write romance. Hope that those who continue to be good people, help others, believe that people and experiences beyond themselves are also important is why I read holiday stories. And often holiday stories reflect our deepest desires to write a past wrong or put the past behind us and start over. Both of those things are what so many people wish for as the year comes to a close and the longest night closes in on us. It is that last hope for change in time to take advantage of it in the new year. 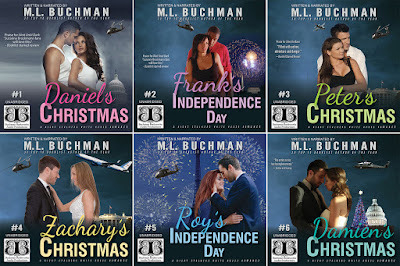 So love that you have so many holiday books AND that they are in audio too. Good move.